What is going on with the weather these days?? It’s February and should be winter temps across the nation, but in Texas we’ve been getting up into the 80s, while there is a blizzard blowing through and tons of snow just days after having 40-50 degree temps. So very strange. And I am so very thankful to live in Texas, because I’m quite sure that a blizzard (and not the delicious ice cream kind for DQ), might just be the death of this anti-cold weather girl. So, in an effort to remind myself of sunshiny days, I made a California-style chicken slider…avocado and bacon are apparently key ingredients to a “California” sandwich, and I’m totally down with that! I would have added some delicious alfalfa sprouts, but unfortunately for me, sprouts of all kinds have been recalled at my local grocery store for, what feels like forever. Seriously, it’s been a year or something crazy. Anywho…I’ve only cooked with ground chicken a few times, and I have to actively look for recipes to use it in a lot of times…why is that, it’s so delicious?!?! The seasonings used in the patties are a little unusual, but so tasty! 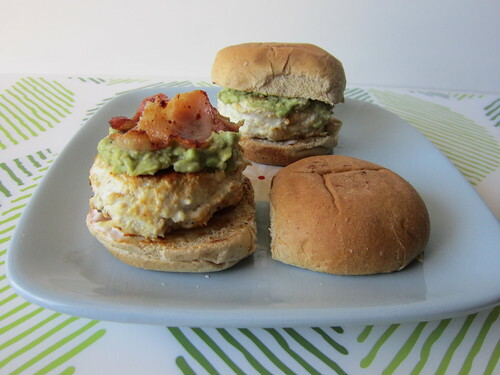 Then topped with avocado and bacon, on a toasted slider bun…pure bliss, my friends!! Cold weather, schmold weather…not in these parts. Not today. I’m sending lots of warm weather vibes and wishes to my friends in the northeast, and hoping that the snow passes quickly and that you have some fun in it while it’s there. Come on Spring…we’re ready for you!! As seen on A Taste of Home Cooking, via Elly Says Opa! Heat a skillet over medium heat and cook the bacon until crispy. Remove to a paper towel to drain the grease. Once cooled, break pieces each piece into 4 pieces. Meanwhile, in a medium bowl, combine the chicken, cumin, oregano, garlic, salt and pepper. Divide the mixture into 8 evenly-sized patties. Heat a skillet over medium-high heat, and cook the patties (in batches) for about 3 minutes per side, or until cooked through. Toast the slider buns, spread a little miracle whip or mayo on the bottom buns, then top with a chicken patty, avocado or guac, and bacon slices.